When word filtered through, shortly before throw in ahead of Mayo's All Ireland quarter-final win over Donegal, that Barry Moran was starting instead of Andy Moran, it caught almost everyone off guard. Where would the big Castlebar man play? In a twin towers approach with Aidan O'Shea on the edge of the square? In the middle of the field with either Tom Parsons or Seamus O'Shea pushing forward? They were two of the most likely options, but as a defensive sweeper, nobody saw that one coming. It wasn't the first time that the Castlebar Mitchels man had been parachuted into the Mayo team at that stage of the competition. Ten years previously Moran was a late addition to John Maughan's Mayo starting 15 against Kerry in the All Ireland quarter final, getting his first taste of action in GAA Headquarters as a 19-year-old. Ten years on and Moran is delighted to still be involved with Mayo and relishing every minute of it, because he knows at some stage it'll all come to an end. "I'm still loving it. As you get older you hear it a bit more that time goes by quickly, it is so true, the last few years especially. When you've been at it 10 years you have to make sure every year counts, and every opportunity you get, you take it with both hands and that's main thing," said Moran last week. 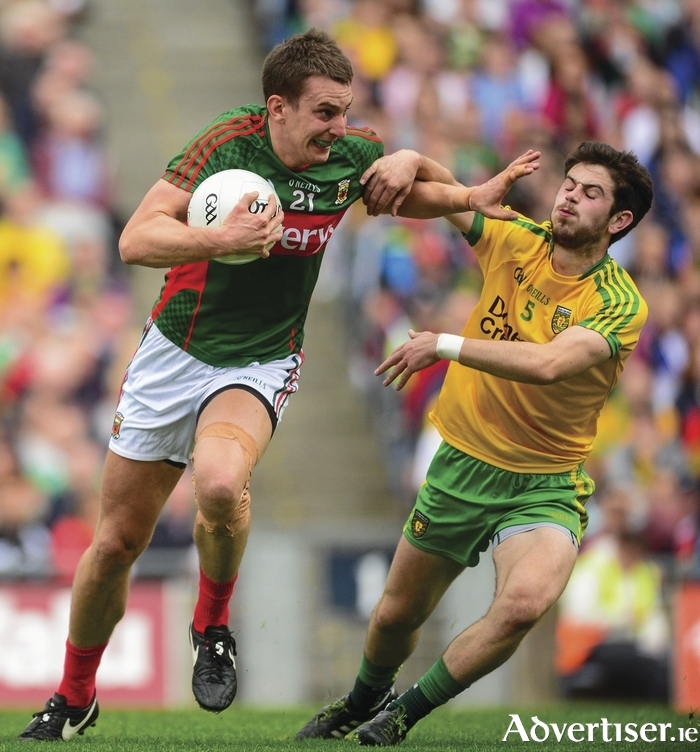 Moran is fighting fit and ready to go, but he knows it's not easy nailing down a starting place on this Mayo team. "From my own point of view I feel fresh and great, and the good thing is the competition in the panel. You have to fight for your position, and everyone has to, and it keeps everyone on their toes and from that you get lads who are playing better. Things are going well, the lads are physically in great shape." It's natural for guys to be upset when they don't make the starting 15, but that's just the reality of the battle for positions in this team at the minute, and Moran is keenly aware of that. "To be honest, it is very frustrating, you're there and you're working hard and you're trying to get your place. But then if you're not picked you row straight in behind the lads and you have to be ready to come in. I suppose it was awful unlucky for Seamus O'Shea in the Connacht final, I think he went off after 25 minutes. But it was an opportunity for me to come in and you hate anyone coming off injured, especially someone like one of your mates like Seamus, but at the same time you just want to get on the pitch. We've a good mix, we've a number of players who can play in any position, we've Aidan at full forward — he can play centre-forward, midfield, he can play anywhere to be honest with you." It has been said that Mayo look a calmer and more mature outfit this year, thinking their way out of problems and going about their business in a more composed fashion. While he hasn't noticed it, Moran puts the fact people are saying things like that down to the experience they've built up over the years. "When you're among the group you don't really notice it, but people looking in have said that, it just goes with the fact that with another year, it's another year gained and more experience. This team is very experienced, it's the fifth semi-final in a row and Connacht title, we've a lot of experience and more calmness that comes with it." When asked what makes this team different from the Mayo teams of the last few years, Moran reckons it's only a few small things, like younger lads in the squad stepping it up a bit more now they have got that bit of experience. "If you look at it over the last few years, even this year we've had a few additions, Diarmuid O'Connor, who has really come on, and other younger lads really stepping up. They're adding something that's new and fresh and is different to this year, and with a change in manangement and back room it brings something fresh and new, with new ideas. We're just looking forward to getting into Croke Park and we always thought over the last couple of years that we are capable of winning an All Ireland, it's a simple as that. We know we've to take it one game at a time and concentrate on Dublin. We know it will be a titanic battle and everything that goes with it and we'll back ourselves all the way. We're a strong team, we've been there before and we've beaten Dublin and most of the major teams in Croke Park. So we just relish the occasion of getting up there, I think the hardest thing is actually the wait for it. We just want to get out and play. Croke Park is where you want to be in August and September." As for the position he played the last day out, there was a bit of preparation and thought put into it in the weeks after the Sligo game, to make sure everyone was tuned into what was happening, Moran said. "We had run through a number of different scenarios with different personal in different areas, so we practised that one for a few weeks. But I didn't know I was going into it until the team was announced. After that Pat and Noel pulled me aside and said they were going with this, but we had rehearsed it over the last few weeks." As for any nerves he felt going out there, it wasn't too bad, the Mitchels man said. "In fairness to Noel, Pat, and Donie Buckley, we'd gone through it so many times at that stage that the minute you get on the field, you're confident you'll do a job. I suppose there is a small bit at the back of your mind that you're thinking, it's kind of new. It had me maybe a bit more on my toes than usual, I'd normally be very relaxed going into games, but I had to be extremely focused to make sure that this worked, because going into a new position like that can be daunting." What about when the first ball was dropped in on top of him and the full back line; what was going through his head? Moran was thankful he had an experienced line behind him to coach him through the position on the field. "The one thing was that Ger Cafferkey was behind me, he's constantly roaring and shouting to take up positions. We'd rehearsed it and in the few days coming up to it I'd have been talking a lot to the full back line and half back line, so I knew what they wanted. On the day it's all about communication; it's all about trying to cut out the direct ball inside and it's all about being in position to help out your full back or corner back whoever is behind you there. Myself and Ger, we'd talked about it before a lot beforehand and on the day of the game, so he could direct me to where he wanted me. It was grand, it turned out alright in the end." While Dublin will pose a very different threat on Sunday, Moran might find himself back on the bench waiting to make an impact from the sidelines, but one thing's for sure, that Moran is ready to grasp every opportunity that comes his way.